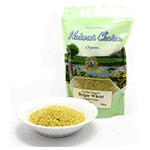 Bulgar wheat is particularly tasty and is normally prepared like rice, sautéed together with onions and green pepper. Add to stir-fry and top with natural soya sauce. Bulgar is one of the staple grains of Middle-Eastern countries, particularly Turkey. It is a very consumer-friendly wheat as it is pre-cooked and thus takes little preparation time.